Driving a motorcycle is truly a unique situation compared to other driving experiences. You get a freedom and a rush that most other drivers will not encounter. You get the luxury of a fast and fuel-efficient vehicle that can maneuver in and out of congested traffic. Along with all the perks exists dangers that every motorcyclist must face. Two factors that lead to the dangerous nature of motorcycles are the absence of a protected covering and the lack of visibility among other drivers. An absence of a protected covering puts the motorcyclist at a high risk for serious injury when in an accident. Visibility can be difficult for other drivers because they often do not expect to see and can overlook a motorcyclist that is approaching them. 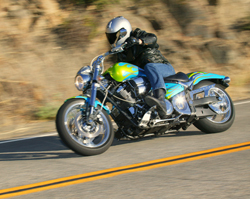 Despite popular consensus, motorcycle accidents are most often the fault of a careless automobile driver. Poorly planned road construction and faulty road design are also big contributors to the nation’s motorcycle accident ratio. The latest report by the NHTSA showed that in 2004, 76,000 people were injured and 4,000 people were killed by motorcycle accidents in the United States. Of the fatal accidents, 50% were caused by a collision with another vehicle. 36% of fatal accidents involved speeding, 34% involved alcohol, and 24% involved people driving with an invalid license. Incredibly, 80% of motorcycle accidents end in death compared to 20% of car accidents. In 2003, per vehicle mile traveled, motorcyclists were 23 times more likely than car drivers to die in a vehicle accident. There are also laws dictating handlebar height in this state. Handlebars cannot be positioned so that the hands of the driver are more than six inches above their shoulders. Lane splitting, illegal in many parts of the country, is permitted by the California Highway Patrol. Cases involving motorcycle accidents can encompass a plethora of issues. In the case of Timothy L. Sloop v. Oakland Paper & Supply, Inc.; HTB Investments LLC; and Michael E. Williams, the plaintiff was awarded $1,429,000.00 in a rear-end accident. . In 2009, Timothy Sloop was struck by a paper delivery truck resulting in a brain injury. Michael Williams was driving a truck leased by Oakland Paper & Supply Inc. and owned by HTB Investments LLC., when he rear-ended Sloop, throwing him 15 feet from the motorcycle. He rolled another 85 feet before coming to a complete stop. Sloop received compensatory damages for the injuries, pain and suffering as well as long term effects he will suffer. All motorcycle accident victims deserve compensation for their accident. The objective behind compensatory damages is to restore the victim of the accident to the original state they were in prior to the accident. Moseley Collins is experienced in motorcycle accident claims and can maneuver the red tape that can mean a lot to the value of the case. He is well versed in the statute of limitations for motorcycle accidents in California and will make sure your time doesn’t run out. The first 24 hours after a motorcycle accident are vital to the case. Contacting a lawyer as soon as possible is an important key to a successful claim. Contacting witnesses, gathering photos and evidence is a critical part of the case proceedings and can only be successfully completed in the first days after the accident. Very specific documentation forms and reports must be filed accurately. Most legal proceedings are not obvious to the layperson. The knowledge of an experienced attorney is the key to obtaiing a fair settlement. If you or a loved one has been injured in a motorcycle accident in Sacramento County, you will need a lawyer with experience. Call Moseley Collins at (916) 444-4444 for a free consultation.